Home » #LadiesOfLondon » #LadiesOfLondon Star Marissa Hermer Sets The Record Straight About Feuding With Co-Star and Ex-Bestie Juliet Angus! #LadiesOfLondon Star Marissa Hermer Sets The Record Straight About Feuding With Co-Star and Ex-Bestie Juliet Angus! 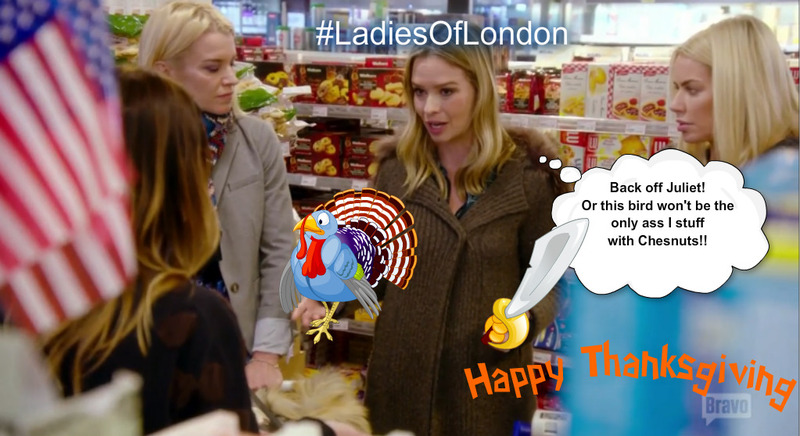 Season 2 of Bravo’s Ladies Of London kicked off in the US just a few weeks ago, but we are already knee-deep in drama. Former BFF’s Marissa Hermer and Juliet Angus have drawn swords, and neither is giving way over “Turkeygate.” Marissa explains to BravoTV.com her take on the situation. Bravotv.com: Tell us about Carols at The Royal Albert Hall. Were you surprisedJuliet took being not invited as a slight? MH: Christmas Carols at the Royal Albert Hall is one of my favorite family Holiday traditions and I love sharing it with my nearest and dearest. I was surprised that Juliet took not being invited as a slight – after our Thanksgiving drama it would have been strange if I HAD invited her! I hadn’t spoken to her in a few weeks so for me to then reconcile with her while my family was in town for that event just wasn’t the right place – plus I never know if something is going to explode between us and though I never want to hurt anyone’s feelings or exclude anyone, I just didn’t want any drama on that day. MH: I’m thankful that Juliet asked me to sit down with her to clear the air – we hadn’t spoken to each other in a few weeks so it’s always good to communicate and get perspective about how someone else is feeling. There was a lot of drama surrounding Thanksgiving and for me it was a reality check on the state of our friendship. Juliet brings a lot of fun to any situation but she also brings a lot of drama – and during the holidays my ‘FUN’ cup runneth over, but as I was hosting my family in London, and working nonstop (the holidays are the busiest time of year for our restaurants, bars, and nightclubs), I couldn’t handle any more drama. I needed to take a step back and set some boundaries. Juliet was the one who actually described the new chapter of our relationship as BFF to F, but I couldn’t have described it more perfectly. We can still have fun with each other and enjoy each other’s company as friends – but without the pressure and the expectation of a best friend – as we were clearly both disappointing each other and not able to deliver on the best friend relationship level.